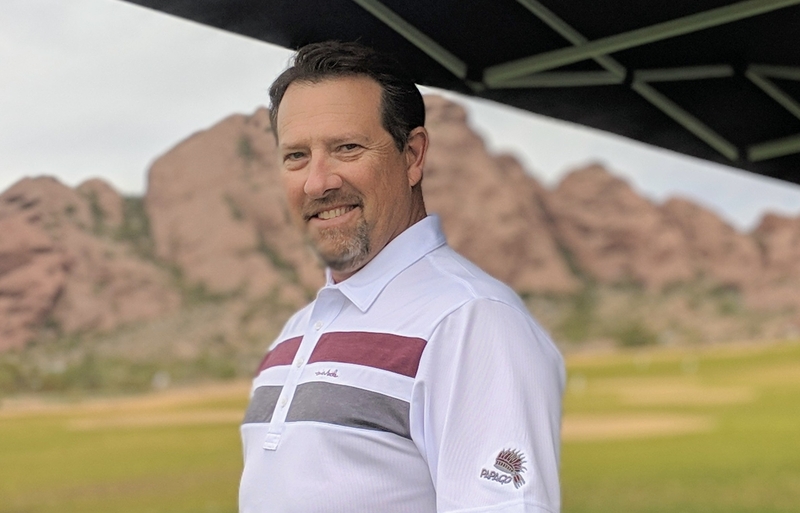 PHOENIX – Matt Trimble, a Class A-6 PGA of America Teaching Professional, recently moved his golf instruction operation from ASU Karsten Golf Course to Papago Golf Course. In addition to teaching recreational golfers from 1992 to 2018, Trimble served as an instructor for members of the nationally ranked ASU Men’s and Women’s Golf Teams as well as a volunteer assistant coach. "Moving to Papago definitely helps me to stay in step with the teams to help out in any way needed," said Trimble. "It’s also a wonderful facility for the many other students I teach with a variety of practice areas and a challenging golf course. I look forward to helping them learn to play their best golf at Papago for years to come." An Arizona State University alumnus, Trimble worked at Scottsdale’s Desert Highlands Golf Club for seven years, where he honed his craft under head golf professionals Duff Lawrence and John Miller before his stretch at ASU Karsten Golf Course. Trimble has logged more than 20,000 lessons in his 25-plus years as an instructor, and he is professionally trained to fit PING and Titleist equipment. Trimble has been listed on Golf Digest’s ranking of "The Best Teachers in Your State" for Arizona for the last eight consecutive years, and high-profile testimonials endorsing his teaching credentials include some of the game’s best players and coaches alike. "Matt Trimble has been a positive factor in my experience as a player at ASU," said Jon Rahm, No. 7 on the Official World Golf Rankings as of January 9, 2019. "While at ASU he was a trusted set of eyes that helped me maintain my swing. He also was encouraging and believed in my abilities throughout my entire experience at ASU. I highly recommend coach Trimble's golf instruction abilities." "Matt is a valuable asset to me and the ASU men's golf program," said Tim Mickelson, former Head Coach Arizona State Men's Golf. "I trust his ability to assess and coach advanced players. He is very effective at communicating with each individual in a unique and personal way. Matt is proficient at helping the players with subtle instruction that instills confidence and produces results." "Matt was an important contributor to my amazing experience at ASU," said Monica Vaughn, 2017 NCAA National Champion. "I have the utmost respect for him as a coach and person. He is extremely knowledgeable about the game and works hard to give the best individualized instruction while building lifelong friendships with his students. Matt was essential in helping us to our 2017 NCAA title!" To schedule a lesson with Matt Trimble, call (602) 370-2389, email mtrimble@pga.com or reserve online at mtrimblegolf.com. Design by William Francis “Billy” Bell, Papago Golf Course opened in 1963 as a crown jewel of the City of Phoenix’s municipal portfolio. It hosted the 1971 U.S. Amateur Public Links Championship, and incubated some of Arizona’s most recognizable talent. In 2008, the par-72, 7,333-yard layout underwent a renovation to restore and enhance Bell’s original work in time to host the 2009 J Golf Phoenix LPGA International. And recently, through a public/private partnership between the City of Phoenix, Arizona State University and the Arizona Golf Community Foundation, the club opened a new clubhouse, restaurant, upgraded public practice facilities and a private practice facility for ASU Golf teams. Papago sits on the borders of Phoenix, Tempe and Scottsdale, surrounded by the Papago Buttes less than two miles from Phoenix Sky Harbor International Airport. For more information, visit www.papagogolfcourse.net or call (602) 275-8428. Papago Golf Course is professionally managed by OB Sports Golf Management, a diversified, golf-oriented company with a long history of success in the golf industry. OB Sports currently manages around 65 premier golf courses and country clubs throughout the United States, while expanding its international footprint to include Royal Blue Golf Club at Baha Mar in Nassau, Bahamas, and Dumbarnie Golf Links in Scotland. Known for its comprehensive and personalized services since 1972, OB Sports has become widely acclaimed as the leader in boutique-style golf course management. Named a Top 100 Business in Golf by the National Golf Foundation in 2018, visit obsports.com to get more information, or call (480) 948-1300. Become a Fan of OB Sports on Facebook, follow OB Sports on Twitter, or visit the OB Sports YouTube channel.